(1) Appropriate $659 million "for border security, enforcement of immigration and customs laws, humanitarian assistance, and illegal immigration prevention" through the end of the fiscal year. These expenditures are offset, making the bill budget neutral -- at least in theory. (2) Provide more than $400 million in resources to US Immigration and Customs Enforcement (ICE), and Customs and Border Protection (CBP). (3) Allocate $22 million of "accelerated judicial proceedings" for these immigrants. (4) Devote nearly $200 million for providing housing, food, and medical care to the detained minors as they await processing. (5) Change the aforementioned law "to require that all unaccompanied minors are treated the same as Mexicans for the purpose of removals. This would require unaccompanied children who do not wish to be voluntarily returned to their home country to remain in HHS custody while they await an expedited immigration court hearing(s)." 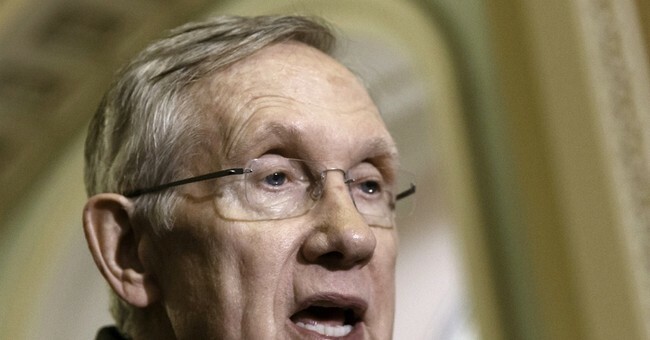 How has Senate Majority Leader Harry Reid responded to this development? Reid says the House GOP border bill may create a vehicle for conference w/ Senate on comprehensive immigration reform. House Republicans say Senate Majority Leader Harry Reid is playing head games to undermine their attempt to pass a $659 million border package. As Speaker John Boehner tries to build support among the Republican caucus for legislation to address the thousands of unaccompanied minors coming to the U.S. from Central America, his Democratic counterpart in the Senate has brought up the toxic issue of immigration reform. On Tuesday, Reid threatened to attach comprehensive immigration reform legislation to any border bill that makes it through the House — a move that would infuriate immigration hawks and split the GOP caucus....It's unlikely that Reid has the votes to actually do that. The four Republican members of the “gang of eight” sent a letter on Friday vowing not to support any border bill that includes their comprehensive immigration bill. Senate Republicans are highly unlikely to provide Reid the votes to do this in any event, given their broad opposition to the Democrats' border proposal. Senator Reid, embarrassed that he cannot strong-arm the Senate into passing the blank check President Obama demanded, is making a deceitful and cynical attempt to derail the House’s common-sense solution. So let me be as clear as I can be with Senator Reid: the House of Representatives will not take up the Senate immigration reform bill or accept it back from the Senate in any fashion. Nor will we accept any attempt to add any other comprehensive immigration reform bill or anything like it, including the DREAM Act, to the House’s targeted legislation, which is meant to fix the actual problems causing the border crisis. Such measures have no place in the effort to solve this crisis, and any attempt to exploit this crisis by adding such measures will run into a brick wall in the People’s House. Dems can't play games with border security and then wonder why conservatives don't trust them to negotiate immigration reform in good faith.